A NASA spacecraft may have witnessed the birth of a new Saturn moon. 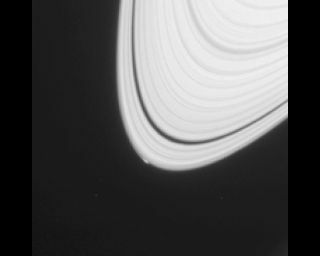 Photographs taken by NASA's Cassini probe in April 2013 show a bright arc about 750 miles (1,200 kilometers) long and 6 miles (10 km) wide at the edge of Saturn's outermost ring (known as the A ring). This arc and some strange bumps nearby were probably created by the gravity of a small, icy object —possibly a newborn moon, a new study reports. The object, which researchers have dubbed "Peggy," is at most 0.5 miles (0.8 km) wide — too small to be seen in images taken by Cassini so far. But the spacecraft will move closer to the A ring's outer edge in 2016, giving reseachers a chance to study Peggy in more detail and possibly even get a picture of the object, NASA officials said. Scientists think these moons formed from ice particles within the rings (which are composed almost entirely of water ice) and then moved outward, growing by combining with other nascent satellites along the way. Studying Peggy further could help shed light on this process, researchers said, even though the object is probably done growing (and may even be disintegrating). Peggy offers a unique opportunity, because Saturn may be pretty much done making new moons. The new study was published online Monday (April 14) in the journal Icarus.